U sually at this point on the lift, I have to shift my skis, grip my poles and brace myself to get off and get out of the way before the next gondola chair comes along and plants me in the snow. But today, the sun is shining and most of the snow is gone. Our family is one of just a few riding to the top at Keystone, so gondola operators are happy to slow it down. It’s easy to hop off onto dry land in the clear, crisp air at what feels like the top of the world. In fact, at this time of year, it’s easy to get around Keystone in general. Restaurants, shops and condominiums are quiet now in this Colorado ski village, which means little waiting and lots of savings for summer travelers seeking spectacular mountain scenery. Many ski resorts are wrapped in giant parking lots, but not Keystone. The gondola rises from one end of River Run Village, a small cluster of hip shops and restaurants surrounded by upscale condominiums. Golf, yoga, theater, concerts, wine tastings, kite-flying lessons and other activities in the village – many hosted by Keystone Resort – have turned it into a year-round destination. 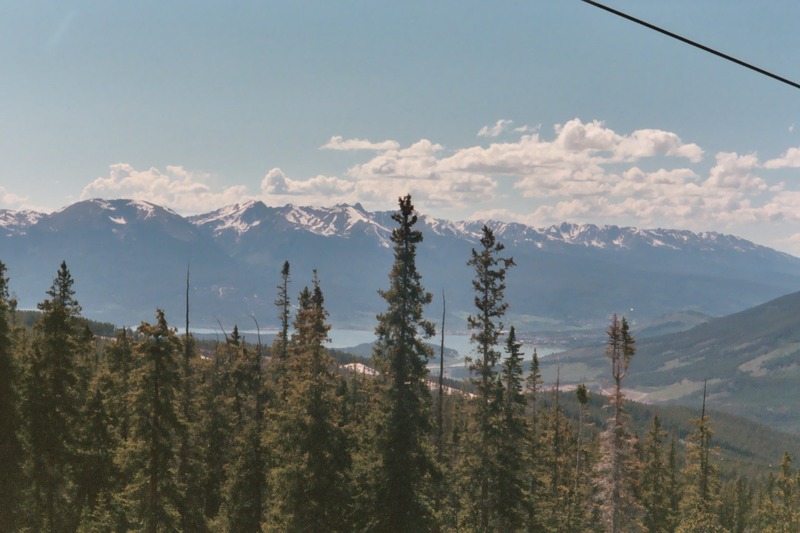 One of the high points – literally – is a ride to the top of Dercum Mountain at 11,640 feet. We bought passes at the base for a 20-minute trip to the breathtaking summit. It was brisk at that altitude, even on the final day of June, and piles of snow still dotted the trails. We spotted a fox on the ride up, but the bicyclists were by far the more entertaining wild life. Men with fat tires and thick skulls barreled beneath our feet, dodging trees and certain death. Those who don’t want to leave a limb on the slope can cruise down the service roads, carved at a more gracious angle. Bicycles can be rented at the base and carried up on the lift. We planned to hike the six miles down, but we started too late in the day and risked getting caught in one of the dangerous storms that often strike in the afternoon. Instead, we walked the 11-7, one of the bike trails that traverse the summit of Dercum Mountain. It offered amazing views of distant peaks and delicate wildflowers as it wandered above the treeline into the alpine tundra and back down through pine forests. Maps available at the base describe the distance and difficulty of a number of hiking/biking trails across and down the mountain. After a long walk and a chilly ride down, we were more than ready for the hot tub at our condo. Lodging is a steal at this time of year; luxury condominiums and homes that rent for hundreds of dollars during ski season often go for half that in the summer. There are countless condos in every direction just a minute away by car, but we wanted to leave our vehicle behind. A search online for River Run Village condos turned up www.vrbo.com – Vacation Rentals By Owner. We secured a one-bedroom palace with fireplace, pullout sofa, balcony, full kitchen and spacious bath for just $100. Our building, SilverMill, included a game room, sauna, heated pool, hot tub and underground parking. The owners, Todd and Diane, even offer their daughters’ DVDs and their kitchen supplies to guests. Contemporary and comfortable, the condo looked down on village sidewalks and out toward the lift. After a soak in the outdoor hot tub, we dressed and moseyed down the sidewalk to the Kickapoo Tavern for dinner. Seats on the patio offered a great view of the play equipment that occupied my daughter while we waited on our meals, as well as the postcard-perfect mountain stream that separates the village and the lift. Later, stuffed and sleepy, we hiked one more time back to the condo to sit and count stars from the balcony before heading to bed. We decided to trek around the shops in search of ridiculously overpriced souvenirs. But there are bargains of every kind to be had during summer in Keystone. T-shirts and sweatshirts were half off the markdown price, and discounted Keystone ornaments heralded Christmas in July. Instead of rolling our eyes, we rolled out of the shops with a few bags of great finds. With other mountains on our agenda that day, we ended our stay after sandwiches in the funky Inxspot, It’s a place of overstuffed chairs, board games, mellow music and books stacked and displayed far and wide. There was a sign emphasizing that the books are for sale, but no one seemed to mind if customers read a bit here and there for free. It was much like our trip overall – a magnificent experience for minimal fees. Plug in Keystone and search for lodging by number of bedrooms, number of baths or number of guests the unit can accommodate. Options include studios through single-family homes. Prices begin at around $75 a night; be sure to ask about cleaning fees and key deposits. Make sure your lodging is in River Run Village if you want to be able to walk everywhere. Every owner is different, but our hosts were organized, cordial and helpful, offering directions and suggested activities by mail and e-mail and calling to follow up. Track down dates and times for all kinds of fun scheduled activities. Some require a pass from Keystone Resort; some are open to everyone but charge a fee; and some are free to all. Examples include Kids’ Discovery every Tuesday, S’more Stories on Wednesday evenings, comedic theater on Thursdays, children’s theater and the National Repertory Orchestra on Fridays, and the Frontier Fair/Market and fireworks on Saturdays. Other one-time activities include wine tastings, kite-flying lessons, gold panning, country dance and more. Don’t miss Lake Dillon, just down Highway 6 from Keystone. In fact, one route to Keystone exits Interstate 70 in Dillon/Silverthorne. It’s more than worth a stop at the stunning reservoir, where snow-capped mountains meet the water right at its edge and colorful sailboats and catamarans glide under bright blue skies. Boats are available for rent at the Dillon Yacht Club, at 9,000 feet the highest yacht club in the United States. They offer sailing lessons there, too. Landlubbers can enjoy a picnic on the grounds and stroll or bike on paths around the enormous lake. An amphitheater looking out over the water hosts occasional concerts and sunrise worship services. Just across the interstate, the Silverthorne Factory Shops beckon, calling shoppers with promises of deals on Coach, Polo/Ralph Lauren, Nike, Gap, Nine West and – coming soon – Banana Republic. See summitcolorado.com/dillon for details.